A common criticism of Tesla Motors (NASDAQ:TSLA) is that it loses quite a bit of money per vehicle sold. From time to time, bears will cite a figure of how many thousands of dollars Tesla loses per vehicle, but those figures are misleading. They invariably refer to Tesla’s operating or net loss divided by vehicle deliveries. For reference, Tesla’s operating loss per vehicle last quarter was just under $15,000. The subsequent bear argument that inevitably follows is that if Tesla can’t make money on luxury vehicles, which is an incredibly profitable market segment, then the Model 3 will only accelerate losses and cash burn. But Tesla could probably become profitable right now if it wanted to. Here’s how. The reason why those attention-grabbing figures are misleading is that they include operating expenses, which includes all of the investments that the company is making to fund future growth. That includes R&D, design, and engineering expenses, as well as massive amounts of capital expenditures to build product tooling and manufacturing infrastructure. Tesla’s gross margin is actually quite impressive and higher than rivals Ford (NYSE:F) and General Motors (NYSE:GM), specifically because Tesla only plays in the niche luxury segment right now. On a gross profit basis, Tesla made over $18,000 per vehicle last year. The operating margin is where Tesla lags, which should expectedly persist as Tesla remains in growth mode. Source: Reuters. All figures shown on a trailing-12-month basis. Operating expenses primarily consist of R&D and sales, general, and administrative expenses (SG&A), although Ford and GM include R&D in automotive cost of sales. It’s useful to look at how these figures compare for Ford and GM, as large and mature automakers. Since Tesla mostly outsources financial services to third-party lenders, I’ll exclude the financial services arms of Ford and GM and compare these expenses to automotive sales. It’s not like the OEMs put a lot of R&D into financial products. Source: SEC filings. Figures shown for 2015. Here’s how Tesla compares. I’m also isolating Tesla’s automotive revenue for the sake of comparability, and incumbents don’t perform service directly like Tesla’s “Service and other” segment. The above figures are Tesla’s GAAP results. If we make the non-GAAP adjustment to revenue to factor in the lease accounting of Model S vehicles with a resale value guarantee, which I believe does more accurately represent the economic reality of its business, non-GAAP automotive revenue inreases to $5 billion. However, I still prefer to use the GAAP figures for R&D and SG&A though, which includes stock-based compensation. If we compare GAAP operating expenses to non-GAAP auto revenue, then R&D is 14% of auto sales and SG&A is 18% of auto sales. Tesla can profitably produce and sell Model S. Image source: Tesla. As a percentage of sales, Tesla’s operating expenses are significantly higher than traditional rivals specifically because it is funding growth, while developing a fundamentally different type of propulsion technology. Ford and GM are quite mature centenarians (although both have also been plunging R&D resources into EV and battery tech for a few years now). Theoretically, let’s say that Tesla resigned itself to being a niche player in the profitable market for luxury vehicles. Assume Tesla decided that it didn’t want to grow to hit its 500,000 annual production target, and brought all of its operating expenses in line to simply maintain existing volume levels. That would include ceasing development of completely new vehicles, focusing R&D efforts on improving the existing platform while offering new body styling every few years. No more capacity expansion with product tooling or new assembly lines either (which would leave a lot of wasted space in the massive Fremont factory). The company also wouldn’t need to worry as much about expanding the Supercharger network as aggressively to accommodate looming Model 3 volumes hitting the road. Oh, and ditching the Model 3 plans would also render the Gigafactory unnecessary, since the Gigafactory’s primary purpose is for Model 3 volumes and battery cost reductions. Model S is already fairly profitable on a gross basis, and the existing trajectories of battery cost reductions and improved energy densities would already help Model S margins improve. 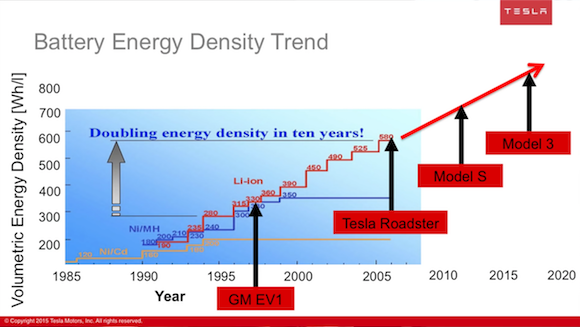 Battery energy density continues to rise, even without a Gigafactory. Image source: Tesla. If Tesla did all of this, I have no doubt that it could quickly achieve profitability. Assume that Tesla could realize percentage figures comparable to its larger rivals if it abandoned Model 3. At a 20% gross margin, if R&D were 5% of auto sales and SG&A were 10% of auto sales, Tesla could have hypothetically posted operating income of $250 million last year from just auto sales (adjusted for lease accounting but not stock-based compensation). Gross profit from service is negligible. Model 3 won’t build itself. Image source: Tesla. But that’s not the plan. It’s never been the plan. Model 3 has always been the end goal: an affordable EV with sufficient performance to satisfy mainstream consumers. Even the incumbent OEMs will burn through incredible amounts of capital to get there. They just have large existing businesses to help subsidize that development. Tesla doesn’t have that luxury, so it’s funding the path to Model 3 with luxury vehicles, with a dash of external capital raises on the side (which should be over by now). Tesla has no intention of abandoning its Model 3 growth plans. So yeah, it will be pretty expensive and unprofitable for a while on a GAAP basis. Get used to it.